If you’ve ever wanted your own custom knife to take along on that camping, hunting, or fishing trip, or to give to a family member or a friend as the perfect gift, Make Your Own Knife Handles has you covered. 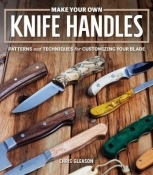 All you need is the knife blade of your choice, easily picked up at any woodworking store or knife shop, and Chris Gleason’s new book, and you’ll soon be customizing your own beautiful knife. With simple construction techniques, Make Your Own Knife Handles covers all the basics of selecting the wood, prepping it for your blade, and how to assemble the knife. The 16 projects cover all the styles you’ll need, from a simple folding knife and kitchen paring knife to an Alaskan Ulu and hatchet. With a knife kit and a little bit of wood and time, you’ll have a custom blade that will soon become your most trusted friend.